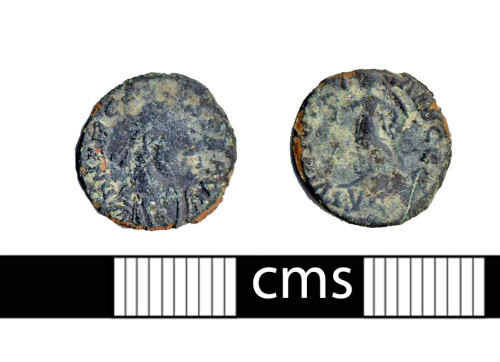 A worn copper alloy Roman nummus (AE4) of Arcadius (AD 383-408), possibly a contemporary copy dating to the period AD 388-395 (Reece Period 21). VICTORIA AVGGG reverse type, mint of Lyon. RIC IX Lyons 44d. A copper-alloy nummus of Arcadius (383-408); VICTORIA AVGGG; Victory advancing left, holding wreath and palm; Lyons, 388-395; Reece period 21.